First Growth Wines is a partnership of myself and my family dedicated to the presentation of small parcels of wine from selected French producers. I have had a 40 year association with the wine industry as winemaker, grapegrower and consultant. Most recently I was the senior sparkling winemaker for Treasury Wine Estates. A position that saw me manage the production of nearly 30 million bottles of sparkling wine annually. I also directed the production of their cold climate Tasmanian wines. I have spent almost 15 years working with the grape varieties Pinot Noir and Chardonnay. For the last 10 years I have visited France on virtually an annual basis and continued my passion for these varieties. I have obviously concentrated on the vineyards of Champagne and Burgundy. Over this time I have come to a close understanding of the regions, their wines and their producers. For the last 12 months I have focused on sourcing wines from a number of small growers that reflect the communes where they are grown. As such, I have been able to put together a portfolio of wines that show quality, typicity and value. As an indication of the respect we have for our wines at First Growth, they are all shipped direct from France in reefer containers at 14°C and then stored in our Sydney warehouse at 12°C. 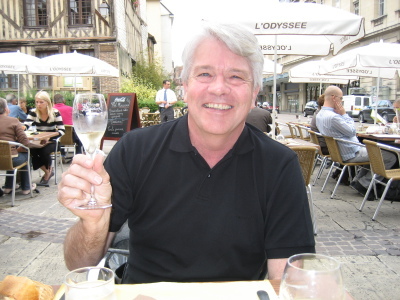 Myself doing a little bit of research in Troyes - the major Champagne town in the Aube.